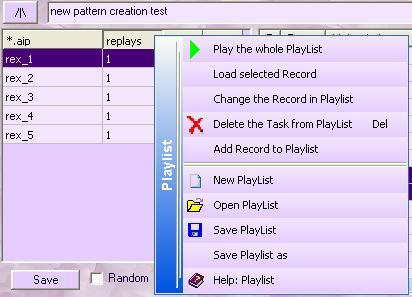 Playlist is designed to replay several Records at once. To hide/show the Record list use button (in the picture it is in the left-hand upper corner). 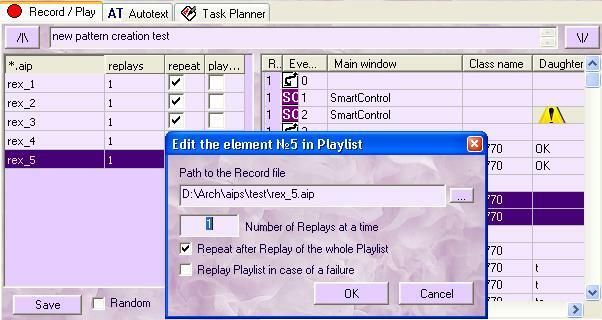 To replay the whole Playlist, use the Tree list of Records or the contextual menu of Playlist itself. When you press , you'll see the dialogue box for editing the Record properties in Playlist. The tick means, that after the whole Playlist has been Replayed, the given Record will be Replayed again and again until it is stopped by the user. If there are several such Records in Playlist, they will all be Replayed again and again either by turns or at random. If you wish to use the Playlist further, you'll have to save it ,as Playlist is not saved automatically, when you leave the program. 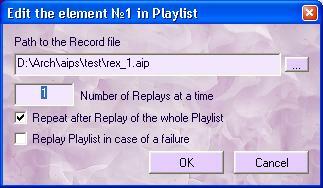 The tick means, that Playlist replay will not stop in case the given Record Replay ends in a failure. Thus, the next Record in Playlist will be Replayed. The only way to Replay the whole Playlist is through its contextual menu, item. Two modes for Playlist Replay: at random or in the order listed in Playlist, depending on the tick . During the whole Replay time (except for the search time of Pixel Control images), the window "Stop me" is shown in the right-hand upper corner of the screen. You can also stop the Replay by pressing Escape or Ctrl+Shift+S. In the Playlist column "cycles" you can see a number of replays for each Record. The column "repeat" shows, whether the Record should be replayed again after the whole Playlist Replay. It can be changed in the editing dialogue box with the tick . The column "play continue" shows, whether Playlist should be replayed after the Replay failure (the tick ).